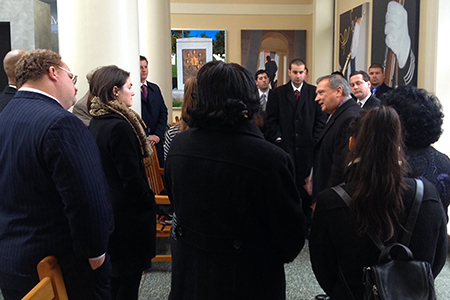 West Windsor, N.J. – On December 3, Mercer County Community College (MCCC) Funeral Service students got a VIP tour of Arlington National Cemetery, the country’s most hallowed burial ground. Arlington Superintendent Jack Lechner, a 1976 alumnus of MCCC’s first Funeral Service class, facilitated and conducted the visit. “Mr. Lechner could not have been a better host. He gave our students a profound experience of the cemetery and its mission,” reports Funeral Service Program Coordinator Michael Daley. Lechner spoke to students about the history of the cemetery, as well as its particulars and protocols. “Arlington’s ceremonies and rituals are performed with great care and regimented to maximize the respect shown to those interred,” Daley said. The group visited the grave sites of American Presidents and the resting place of Timothy Maude, the highest-ranking military officer killed during the September 11th attacks. “These monuments serve to emphasize the range and rank of those permitted to be buried at Arlington,” Daley observed. Students also witnessed a burial ceremony with full military honors for two high-ranking officials, as well as the Changing of the Guard at the Tomb of the Unknown Soldier. Two MCCC students, both of whom are veterans, were given the rare opportunity to place a wreath at the tomb, an honor most often reserved for Presidents, foreign dignitaries and high-ranking military officials. The last stop was a visit to the Memorial Amphitheater, where the chief curator discussed notable historical artifacts, including medals and burial flags posthumously awarded by President Eisenhower while establishing the Unknown from the Korean Conflict and President Reagan for the Unknown from the Vietnam War. Arlington Superintendent Jack Lechner, right, begins the day-long tour at the Welcome Center, where he presented a brief history. 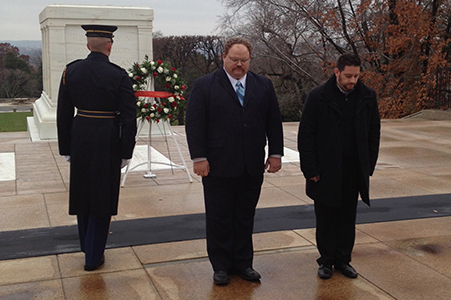 MCCC military veterans George C. Scott, second from left, and Matthew Freeman had the honor of participating in the wreath-laying ceremony at the Tomb of the Unknown Soldier. 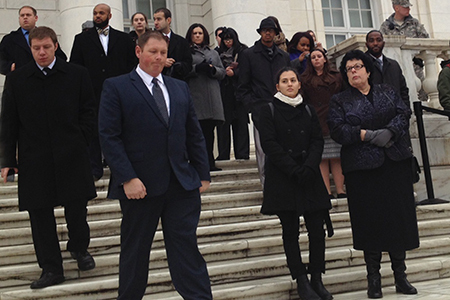 Students concluded the tour with a new perspective on the care and respect given to the nation's fallen heroes.